The Catholic Church’s new cardinals and new archbishops must be willing to risk everything, patiently endure evil and bear crosses like Jesus did, Pope Francis said. “The Lord answers our prayers. He is faithful to the love we have professed for him, and he stands beside us at times of trial.” Just as he accompanied the apostles, “he will do the same for you,” the pope told five new cardinals and about 30 archbishops named during the past year. Pope Francis addressed the new cardinals and archbishops during his homily at a Mass in St. Peter’s Square June 29, the feast of Sts. Peter and Paul, who are the patron saints of the Vatican and the city of Rome. In what has become the standard practice, the pope did not place the pallium on new archbishops during the liturgy. Rather, after the Mass, the pope handed each archbishop a pallium folded up in a small, simple wooden box tied with a brown ribbon as a soloist sang “You Got to Walk that Lonesome Valley,” a traditional American gospel song. The actual imposition of the woolen band was to take place in the archbishop’s archdiocese in the presence of his faithful and bishops from neighbouring dioceses. The pallium symbolises an archbishop’s unity with the pope and his authority and responsibility to care for the flock the pope entrusted to him. It tells an archbishop that his role is to be a good shepherd to his flock, “to help the people entrusted to my pastoral care to learn to live in unity and peace, to manifest that truth and love of Jesus Christ and the Gospel,” he said. 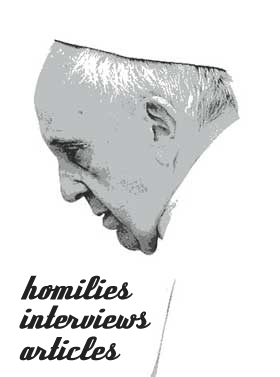 People must ask themselves whether they are “‘armchair Catholics,’ who love to chat about how things are going in the church and the world,” he said, or if they are “apostles on the go,” who are on fire with love for God and ready to offer their lives for him. Apostles of Christ “know that they cannot just tread water or take the easy way out, but have to risk putting out into the deep, daily renewing their self-offering,” he said. In different parts of the world, “often in complicit silence, great numbers of Christians are marginalised, vilified, discriminated against, subjected to violence and even death, not infrequently without due intervention on the part of those who could defend their sacrosanct rights,” the pope said. However, there is no Christ and no Christian without the cross, he said. “Christian virtue is not only a matter of doing good, but of tolerating evil as well,” he said, quoting St. Augustine. Enduring evil means “imitating Jesus, carrying our burden, shouldering it for his sake and that of others,” knowing that the Lord is by one’s side. Previous story What Would Jesus Really Do?